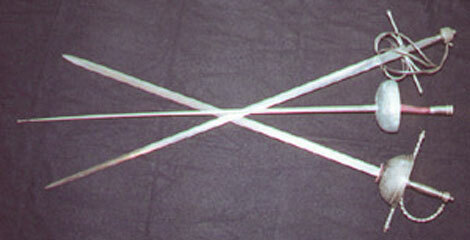 The second of the three swords: "The Épée" pronounced:"eh-pay". It's overal length is upto 110cm, the blade being of a maximum of 90cm. Its blade is of a hollow-ground triangular section, for lightness and strength. This blade type is similar to the civilian duelling swords of the 18th and 19th centuries, on which this weapon is supposedly based. Zivcovic gripis a grip for the 21st century. Still new to the game, also known as "elephant's ear". This is also an electric version. The gardaire grip is illegal for épée. The target area for the épée is shown here in white: it consists of the entire body, except hits on to the weapon. The épée is a point weapon, hits are valid when the tip/button is pushed onto the designated target area with what is determined sufficient force (750 grammes and greater) to cause penetration:- if it was a real sharp weapon. Sideways hits are invalid. There is no rule of Priority. The only special equipment needed for épée is a metalised surface for the piste, this allows hits to the floor not to be registered as valid, as the floor can then be earthed away. By the early 19th century duelling was illegal, and when rarely done, done so with pistols. 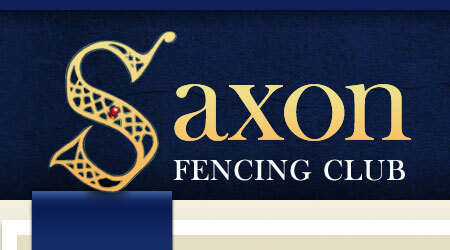 However, the notion of a "for real" style of sword fighting was to encourage some enthusiasts to develope the épée. It is based on the heavier duelling weapons, and the entire body as target reflects the duelling swordsman's need to be able to hit his opponent where-ever it is necessary to prolong his own life!